Manufacturing of Caterpillar mini hydraulic excavators began with an 8-metric-ton machine in Japan in 1987. Seven years later, the machines were introduced in North America. Today, there are 13 machines offered in North America ranging from the 300.9D that weighs less than 1 metric ton to the 308E2, which is an 8-metric-ton Tier 4 Final machine with a high-definition hydraulic system. 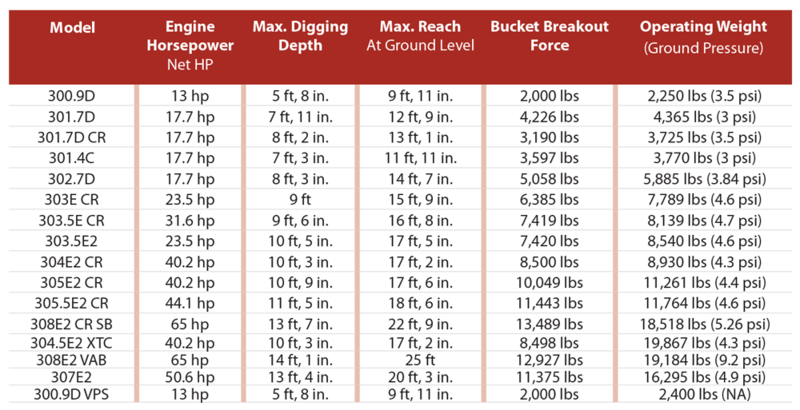 In the less-than-3-ton range, there are six machines (300.9D, 301.4C, 301.7D, 301.7DCR, 302.4D and 302.7D CR) that meet the various needs of operators on a wide array of jobsites. Caterpillar has the 303E CR in its E Series lineup. The 3-metric-ton machine is the right solution for customers seeking an easily transportable machine for restricted areas, congested jobsites and demanding applications. The 60-in. width and 7,782-lb machine offers a compact radius design. E2 Series models including the 303.5E2, 304E2, 305E2, 305.5E2, 307E2 and 308E2 offer a powertrain that provides optimized engine horsepower, says Caterpillar. The machines offer fast, powerful digging with load-sensing hydraulics and a flow sharing system as part of the integrated high definition hydraulic (HDH) technology. Also, the COMPASS (Complete Operation Performance and Security System) display panel comes standard in mini hydraulic excavators from the 303.5 up to the 308. The monitor offers such capabilities as: adjustable auxiliary control; continuous flow setting; auto idle selection; and the Site Reference System. Caterpillar has also just recently introduced new models and new configurations to its fleet, meeting customer needs for more versatility, such as the 304.5E2 XTC (Extra Tool Carrier), the 308E2 VAB (Variable Angle Boom) and the 300.9D VPS (Versatile Power System) unit that can run on diesel or electricity via an electric power pump. 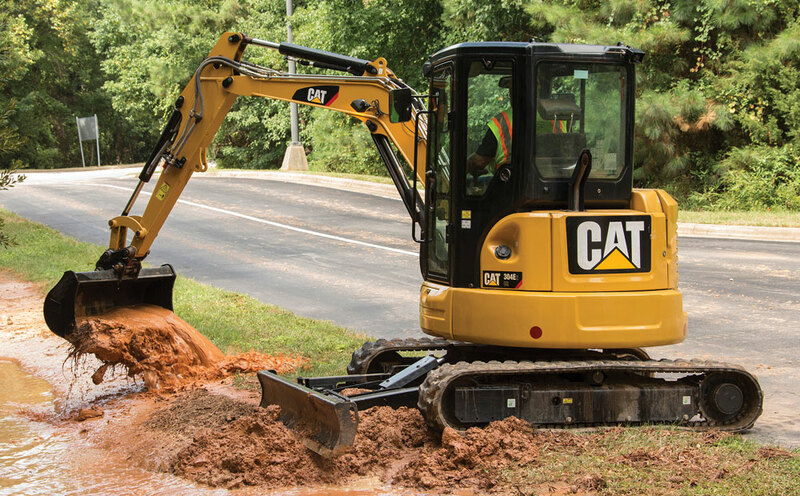 Cat offers as standard or as an option on most models blade float, auto two speed, accumulator, tool-less adjustable armrests, integrated rear camera, site reference system, security system, certified lifting eye, fingertip controls, air ride suspension seats, automatic courtesy safety lighting, bolt-on cutting edges, hydraulic couplers and a front shovel all designed to keep the customer safe, productive and efficient as he or she conducts their daily work. With so many models and options, make sure you do your research to select the best fit for your company. In October 2017, the company introduced its Mini Hydraulic Excavator Universal Coupler, expanding the range of Cat couplers designed to increase machine versatility and production in a variety of applications. The universal coupler either pins to the stick or can be picked up with the Dual Lock Coupler, allowing skid steer attachments to be interchanged and operated on the excavator. Learn more about Caterpillar here.